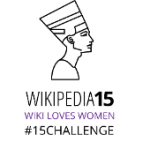 Coinciding with the celebrations around 15 years of Wikipedia, the Wiki Loves Women project launched on the 15th January 2016 with the #15Challenge writing contest on French and English Wikipedias. A minimum of 15 teams were challenged to write one article each to result in at least 15 articles that highlight notable African women. By the end of the contest, 15 English teams (27 participants), 18 French teams (24 participants) and 1 Armenian team (4 participants – this was not planned, but super!) produced 71 new biographical articles in English, 122 new biographical articles in French and 41 new articles in Armenian. Best English article :[[Malouma]] from Team Women in Red (User:Ipigott, User:Megalibrarygirl, User:Rosiest, User:SusunW, and User:1bandsaw). This article already reached a Good Article status ! Best English team : is Team Women in Red. And this is probably the best moment to advertise the Women In Red initiative… their objective is to turn redlinks into blue ones within the scope of women’s biographies and women’s works, broadly construed. Best French team : Equipe Parce-qu’elles-le-valent-bien with Cbyd and HenriDavel, for writing no less than 30 articles (not counting the winning article) of very good quality.